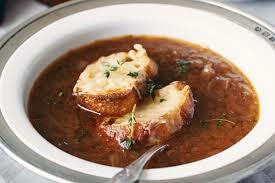 Caramelized onions make for this flavorful rich soup. We recommend topping with a gratin of Swiss and Parmesan (not included). 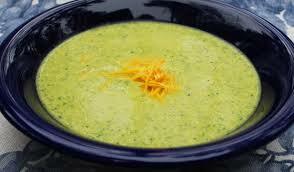 Fresh broccoli, onions and garlic braised in a rich stock, finished with florets and loaded with cheddar. 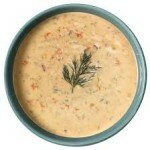 Classic “New England” Chowder with a twist, with celery, onions and potatoes and finished with crème. Rich “seafood” velouté with chunks of surimi shrimp and surimi lobster, brandy and finished with touch of crème. Fresh strawberries and mango with a splash of Muscato served in a flute, perfect starter after an All Nighter !! 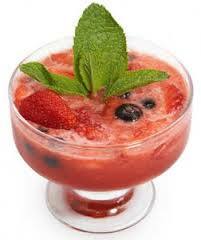 Tomato based raw vegetable soup served in a margarita glass topped with pico de gallo, guacamole and sour crème. 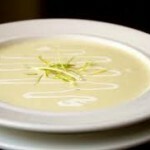 Classic potato leek soup is puréed and finished with braised leek julienne and crème. 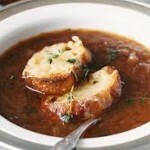 Caramelized onions make for this flavorful rich soup. 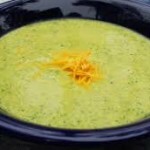 Fresh broccoli, onions and garlic braised in a rich stock, finished with florets. Tomato based raw vegetable soup served in a margarita glass topped with pico de gallo and guacamole. 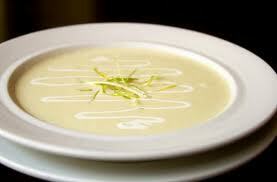 Classic potato leek soup is puréed and finished with braised leek julienne .